MC 65 - On-the-job Efficiency! Your workers can redefine productivity with the MC65 in hand – one of the toughest and most flexible EDAs on the market. Desktop-like application performance and robust scanning, camera and GPS technologies plus a customizable user interface make data capture and information access easier than ever. 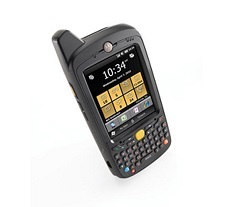 And with the ability to connect to virtually any carrier anywhere in the world, the MC65 rugged mobile computer can serve your business every minute of its life. Get real-time access to critical backend systems and the ability to interact with applications that provide the latest information, enable updates, and relay critical data. Empowers mobile workers to capture photos, videos, bar codes and documents instantly — recording vital information that used to be scribbled down — or missed entirely. An industry first: dual 3.5G broadband WAN connects flexibly to both GSM and CDMA networks. With the appropriate service plans, users can easily toggle between networks. User interface tailored for the enterprise empowers mobile workers to put the applications and functions they use most right at their fingertips. Faster, easier access to what’s really important, to maximize workflow efficiency.